Holy crap! I found some nerd stuff I kinda forgot I had! And I've just repeated the title of this blog post! Amazing! So I'm going through my cupboards and a few boxes and I'm digging through some stuff that I'm thinking of parting with when this little beauty jumps out. It's the launch collector's boxset of the MMORPG 'Warhammer Online'. It's all complete and in fantastic condition. 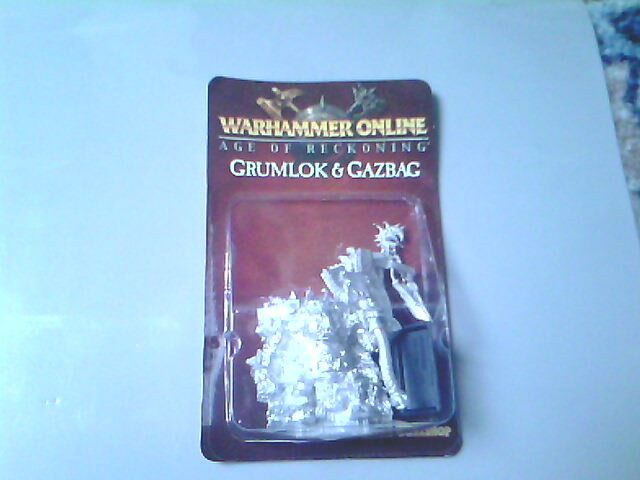 It's got the game, a wonderful hardback 'Art Of' book with some stupendous illustrations, the introductory comic (also in hardback), a mouse mat and, most importantly, the limited edition Grumlock and Gazbag Games Workshop figures still in their blister pack and in as-new condition. I used to really enjoy Warhammer Online. After playing World of Warcraft for a few months and becoming utterly frustrated by the grind I just wanted to play a game where I did some exploring and fought some wars, and this was perfect for it. There were two instances in the game where, playing my favourite character Hellfeur the Bright Wizard, I both inspired my forces to turn the tide of losing fight and win a siege and also made a momentous cockup that lost us the battle and caused an attack on Altdorf that we ultimately lost. My cockup phrase was - 'I don't see any destro'. It was a great game and I had a lot of love for it. What a great find, I'm going to sit down and read the books right now. I never played it. I never even created a character for it. But Pendragon gave me such a wealth of information and a wonderful way of playing a game, of feeling that you were not just playing a game but creating a saga, that I mined it for ideas and information for years. Many of my fantasy games were influenced by Pendragon’s way of doing things and the idea that your actions influenced your character and your family's heritage was exciting and fun to use. I used that idea to document three successive generations of a single player character’s family in a WFRP game that lasted over three years of playing time – the father, the daughter and the granddaughter, all played by the same player. To be truthful, the player never knew the father was of the same bloodline, and we never fully finished the campaign to find the truth. I’m sure if he reads this he’ll have a few questions now. This is what got me started, way back in 1984. It’s not a great game but it does exactly what it needs to do to get new blood into the hobby. 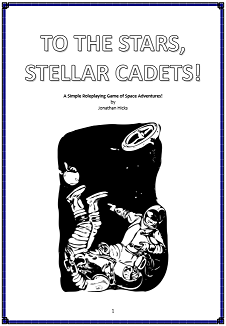 Sometimes, when I see the huge number of pages in new RPGs or the fact that you have to purchase multiple books to enjoy a system, I wonder why it is that publishers don’t target new players with the simplicity of a cut-down version of their game. 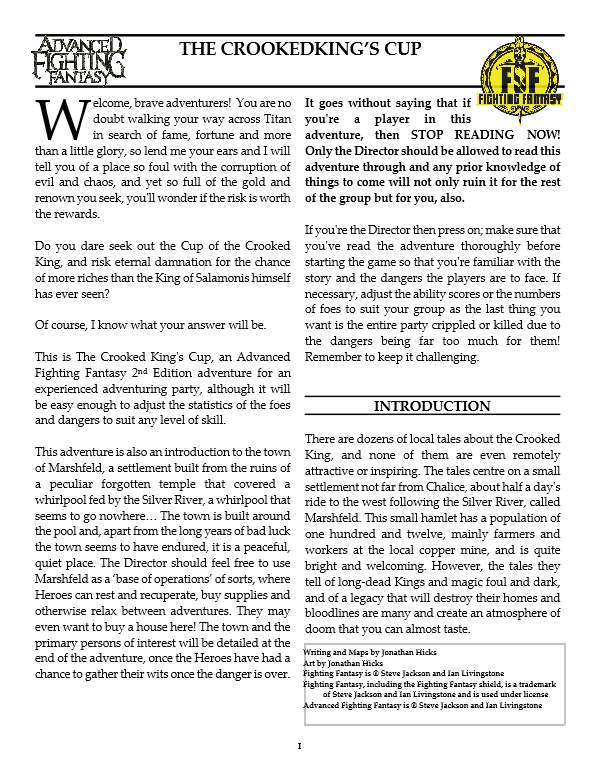 This is what Basic D&D was, a simple game that eased new players into the hobby and introduced them to the world of RPGs. I moved on pretty quickly from Basic D&D to Advanced, but soon after that I stopped playing D&D altogether. There was something about Advanced, in all its incarnations, which turned me off it. It just didn’t seem to have the magic or feel of Basic D&D and all that sense of wonder was lost in charts and tables, rules and regulations. Star Wars was my second most-played game. It was also the largest group I played with - consisting of six players and a GM at its peak - and the games went from running around defying the Empire to designing an entire region of space for our characters to explore and adventure in, the Setnin Sector. 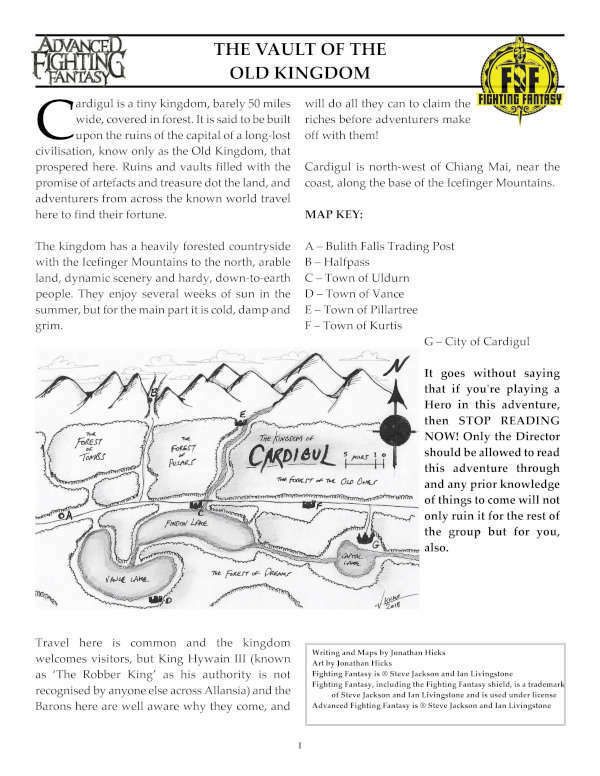 It was, by far, the largest campaign setting I designed and it grew even larger with additions from the players and other GMs. So why does it not appear higher on my list? Well, it is a great game. I like the easy, fast system and the original rulebooks are wonderful to read. I bought the game as a massive Star Wars fan and it reinvigorated my love for roleplaying. It introduced me to large group games and inspired me to create some crazy stuff. 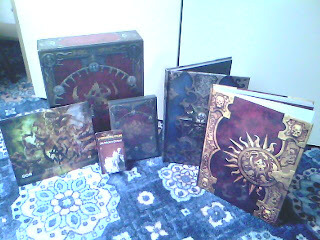 Amongst all this, though, I can’t truly say it changed my attitude to RPGs at all. It definitely got me involved with and taught me how to run large group games, but ultimately it was just that I loved the Star Wars universe and here was a game that allowed me to play in it. The original rulebook was a mighty tome and had absolutely everything you needed to run a game in Warhammer’s Old World – character creation, careers, a full magic system, histories, location details, a bestiary, even charts and tables on insanity, phobias and random magical items. This one book alone was enough to keep a gaming candle burning for years, and indeed it did. 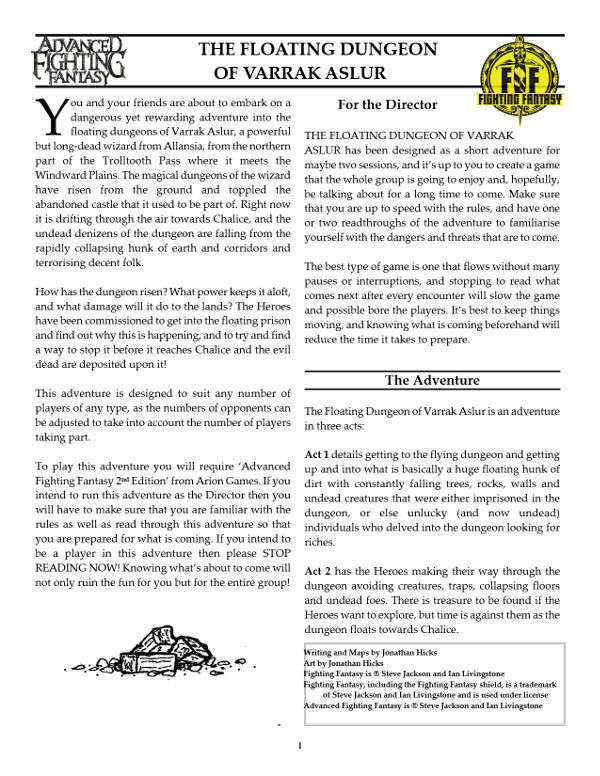 I ran WFRP games for years and in all that time I could simply refer to the rulebook for everything I needed, even inspiration for new games and adventures. I bought some supplements, sure, but they were never used. 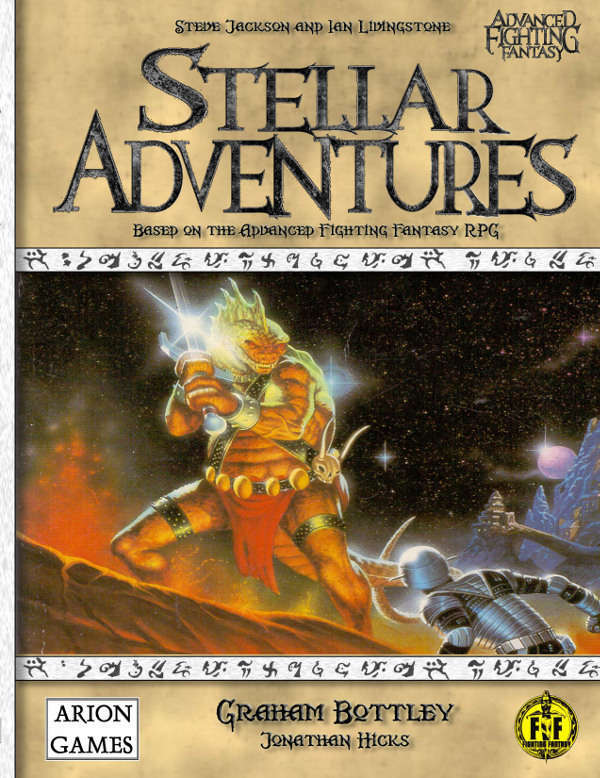 In time the adventures, campaigns and extras I gathered were sold but I never parted with the main solid rulebook, which has been on my shelf for over twenty five years and still gets some use. 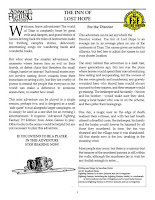 To me, WFRP is what a RPG rulebook should be – it contains every detail you need to run a succesful campaign, and it’s atmospheric and a pretty good read to boot. I love the system and I even like the idea and implementation of careers. With more than 8 years of continuous campaigning with many, many player characters, and delving into the Old World’s history and possible futures, WFRP is, by far, my game of choice. I pretty much needed to have a break from fantasy novels a long time ago. I'd absorbed stories from the greats, the not-so-greats and the simply mediocre, and I'd followed heroes of varying races, sexes and abilities as they trudged through dangers and battled foes. There was always a neat map of the world I was experiencing and, if I was unlucky, a glossary and history to go with it. 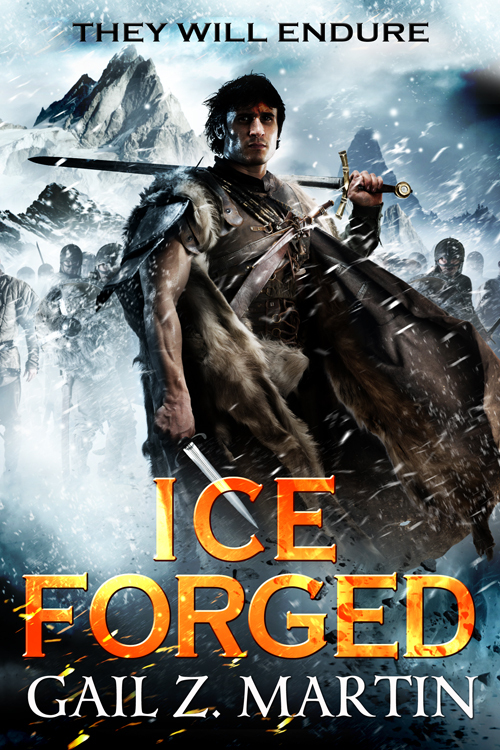 Gail Z Martin's book 'Ice Forged' is the first new fantasy novel I've read in a long time. Luckily for me, it was an absorbing and entertaining read and I didn't have to stop reading every five minutes to refer to a map or seek out a translation in a glossary. 'Condemned as a murderer for killing the man who dishonored his sister, Blaine “Mick” McFadden has spent the last six years in Velant, a penal colony in the frigid northern wastelands of Edgeland. Harsh military discipline and the oppressive magic of the governor’s mages keep a fragile peace as colonists struggle against a hostile environment. But the supply ships from Dondareth have stopped coming, boding ill for the kingdom that banished the colonists. Blaine is a pretty good antagonist and you get a feel for the character almost straight away - a no-nonsense, fists-first man who is very sure of himself and his abilities. At first I was concerned he was going to be a hero with shining white teeth who can't do wrong but as the story unfolds and you get to know him and the people he's teamed up with you begin to see him as a complex but decent man. His fellows are also interesting (if a little underdeveloped but that's not an issue, to be fair) and it makes for a good group you'd like to see go on a quest or two. The first part of the book is a lot of world building but there seems to be a lot of portentous doom-laden prophecising going on about something bad coming, and then when something a bit bad does happen then there's a bit more talking about it. There's a moment where I found myself thinking 'just get on with it!' and I simply wanted the book to get to it's point. Nevertheless the world building is very good and the characters are given time to grow which gives you time to get to know them, but there is a point where I feel I know enough about the people to want to see the story put their talents and personalities to use. Luckily, the book shifted up a gear just when I started to get worried that the story wasn't going anywhere. Once the disaster hits and the world starts to change (it has a post-apocalyptic feel to it, as the world is thrown into chaos) the heroes finally get their quest on which is a good thing, but just as the story starts to heat up and the action starts to flow, the book just kind of... stops. There's a good reason to want to continue with the second book, that's for sure, but I was expecting a better climax, or at least a shock revelation or twist that would leave you waiting with baited breath for the next installment. Sadly, you don't really get a satisfactory ending in that vein and you feel like that you've not been left on a cliffhanger, just that you've been left hanging. Ice Forged is a very good book with some very well-defined characters and an intriguing plot that, if you give it time and don't expect it to leap out at you immediately, really delivers. The ending might feel a little flat after putting effort into getting to the end - and it is more than 500 pages long - but with the promise of another book to follow there's no reason to dismiss this volume at all. Regular visitors to this blog will have noticed a change to the design and presentation of this site and the fact that posts have slowed somewhat over the last few weeks. This is because I've taken a break, stepped back from the hobby for a little while and tried to get a fresh perspective of what this blog is about and what it is I want to do with it. 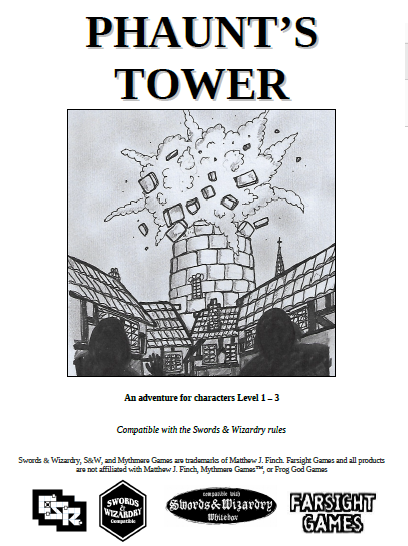 I love tabletop gaming - roleplaying, boardgaming and, when I get the chance, wargaming - and I will no doubt continue to do it for a very long time, and whitter on about it on this blog. But there's plenty of other nerd stuff I really enjoy as well - movies, books, comics, toys etc - and I have plenty of things to say about these, too. I did briefly consider creating a new site which I designed and was going to call 'Farsight Nerdrage', designed specifically for these other loves of mine. 'Farsight Nerdrage' never materialised and I deleted the blog before posting a single comment, mainly because I honestly don't think I have the time to run two blogs about my hobbies. Instead, I've decided to amalgamate the two and write about everything I enjoy on this blog alone. There'll still be gaming articles and reviews but they'll be supported by other stuff that interests me, and hopefully you'll be interested, too. I've decided to be much more opinionated in my articles and express my views as I see fit. This isn't meant to provoke or upset people who have differing views from me but to invite discussion, heated or otherwise. I'll also be inviting guest writers, too - if you have an article, review or just want to air some views then email me your stuff and, if it's suitable, I'll post it here. To make sure you're kept up to date it might be worth subscribing so that you get emails letting you know about what's new, or 'Like' the Facebook page, or follow me on Twitter. There's plenty of ways. So, let your friends know. 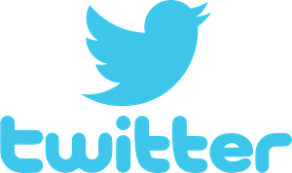 Farsight Blogger will be back soon to take a new path in it's journey, and I hope you'll come with me. Farsight Blogger isn't here right now as we're having a break for the summer. We're also going through some changes and redesigning the focus of this blog, moving away from general gaming-centric articles and reviews and embracing nerd culture as a whole, so expect some changes over the next few weeks.